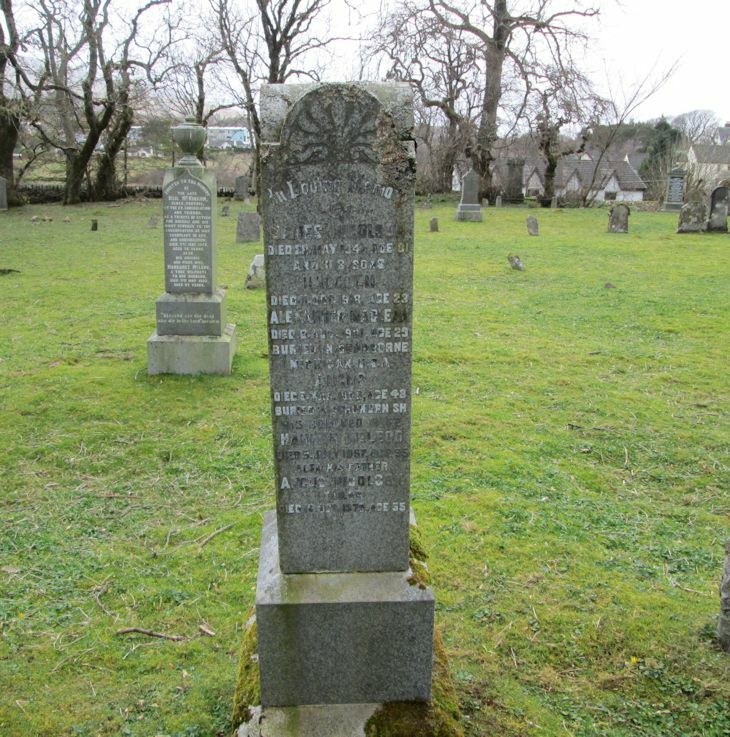 In loving memory /of/JAMES NICOLSON/died 28 May 1941 age 81/and his sons/MALCOLM/died 11 Oct. 1918 age 23/ALEXANDER MACLEAN/died 9 Aug. 1921 age 29/buried in Dearborne/Michegan U.S.A./ANGUS/died 5 Mar. 1935 age 48/born in Stronurnish/his beloved wife/HANNAH McLEOD/died 5 July 1957 age 95/also his father/ANGUS NICOLSON/tailor/died 6 Oct. 1879 age 55. Born 1859–1860, Parish of Portree, Inverness-shire, Scotland. Added by Gordon J Callon on 11 June 2016. Born 1862–1863, Parish of Portree, Inverness-shire, Scotland. Born 1895–1896, Parish of Portree, Inverness-shire, Scotland. Born about 1887, Parish of Portree, Inverness-shire, Scotland. Born 1823–1824, (possibly at Snizort, ) Parish of Portree, Inverness-shire, Scotland. 1901, at Camustianavaig: Hannah Nicolson, 38 (b. c. 1863), Joiner's Wife; Jemima Nicolson, 16 (b. c. 1885), General Servant (Domestic); Angus Nicolson, 14 (b. c. 1887), Scholar; Maggie Nicolson, 12 (b. c. 1889), Scholar; Flora Nicolson, 10 (b. c. 1891), Scholar; Kate Nicolson, 8 (b. c. 1893), Scholar; Malcolm Nicolson, 5 (b. c. 1896); Dolina Nicolson, 3 (b. c. 1898); all born in the Parish of Portree. Added by Gordon J Callon on 12 June 2016. 1911, at 151 Second Avenue, Old Kilpatrick: James Nicolson, 52, Carpenter; Hannah Nicolson, 49; Jemima Nicolson, 26, seamstress, Angus, 24, carpenter, Flora, 20, typist; Catherine, 18, shop girl, Malcolm, 15, school, Dolina, 13, school, Alexander, 9, school. Added by Alastair Banks on 17 March 2017.